This June 10, 2018, satellite image provide by DigitalGlobe shows the 416 Fire northwest of Hermosa, Colo. At right Highway 550 is visible. 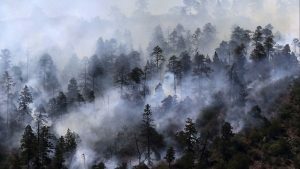 Denver, Jun 12 : Extreme fire danger prompted officials Monday to say they are shutting down a sprawling forest that includes some of Colorado’s most stunning mountains in a region that attracts tourists from around the world, a rare tactic also being used in neighboring states as the U.S. Southwest struggles with severe drought. National forests and parks in Arizona and New Mexico have already been shut down as precautions. San Juan National Forest officials in southwestern Colorado planned to close hundreds of miles of trails and thousands of miles of back roads to hikers, bikers, horseback riders and campers as soon as Tuesday to prevent the possibility of an abandoned campfire or any other spark from starting a wildfire. It’s the first full closure of a national forest in Colorado since 2002, which was another very dry year. The closure will remain until sufficient precipitation eases the fire danger. The move comes as the residents of more than 2,000 homes have been forced to evacuate because of a fire that started June 1 in the forest and spread to about 35 square miles (91 square kilometers) as of Monday. Authorities are still investigating how the fire started. No homes have been lost although the fire came close to buildings Sunday night, authorities said. Fire managers credited advance fire mitigation work by homeowners for helping firefighters save the structures. Much of the U.S. West is experiencing some level of drought and the Four Corners region — where Arizona, New Mexico, Utah and Colorado meet — is at the center of a large patch of exceptional drought. In New Mexico, the Santa Fe National Forest, along with portions of three national park sites, closed June 1 because of the fire danger. The Santa Fe forest is among New Mexico’s most popular getaways. The U.S. Forest Service also is planning to bar recreation in a handful of ranger districts in the Cibola National Forest outside of Albuquerque beginning Friday. Portions of national forests in Arizona were also closed in late May because of severe fire conditions. Full forest closures are not common and the Forest Service stresses they’re only done as a last resort. The Coconino National Forest in Arizona shut down completely because of fire danger in 2006 for nine days. A 2002 shutdown lasted nine weeks, including both Memorial Day and July 4 holidays, and other national forests had closures that year. Colorado’s latest closure will also bar non-recreational uses, although ranchers, for example, who use some of the forest’s over 2,800 square miles (7,252 square kilometers) for grazing will be able to seek exemptions, San Juan National Forest spokeswoman Cam Hooley said. If any exemptions are granted, those users would be required to take precautions, such as carrying water, shovels and fire extinguishers and possibly only allowed in during certain times of the day, she said. “We recognize that this is difficult for the local businesses and the local economy and just ask that people just be understanding and patient,” Hooley said. The region, which is also home to Mesa Verde National Park, relies heavily on visitors to support its economy and fire managers have tried to help encourage them to keep coming by including links to tourism information in their regular fire updates. One of the main tourist attractions, a historic scenic railroad that takes riders through the majestic San Juan Mountains in the forest, has suspended its service and furloughed its seasonal workers. It may reopen later this month with diesel engines to replace its traditional coal-fired locomotives that can throw sparks. Sweetie Marbury, the mayor of nearby Durango — about 10 miles from the fire — said there are plenty of things people can do in the area, including river rafting, cycling and fishing and learning about history at places like Mesa Verde and Chimney Rock National Monument. “We are resilient in Durango. We bounce back,” she said.